Golden West Café – eating my way through Charm City! Like so many spots on the Avenue, there is an eclectic vibe happening in this place; a lot of art on the walls, bright colors, and old school murals. I generally head here for a Saturday recovery breakfast or late night food. There is a long bar in the back, which is where we grabbed a seat and a beer. It doesn’t ever seem to matter what time it is, I usually get breakfast at Golden West. It’s served all day. I chose the breakfast polenta – a nice square of polenta cake with green chili sauce and eggs. They don’t poach, so I went with over-medium eggs. 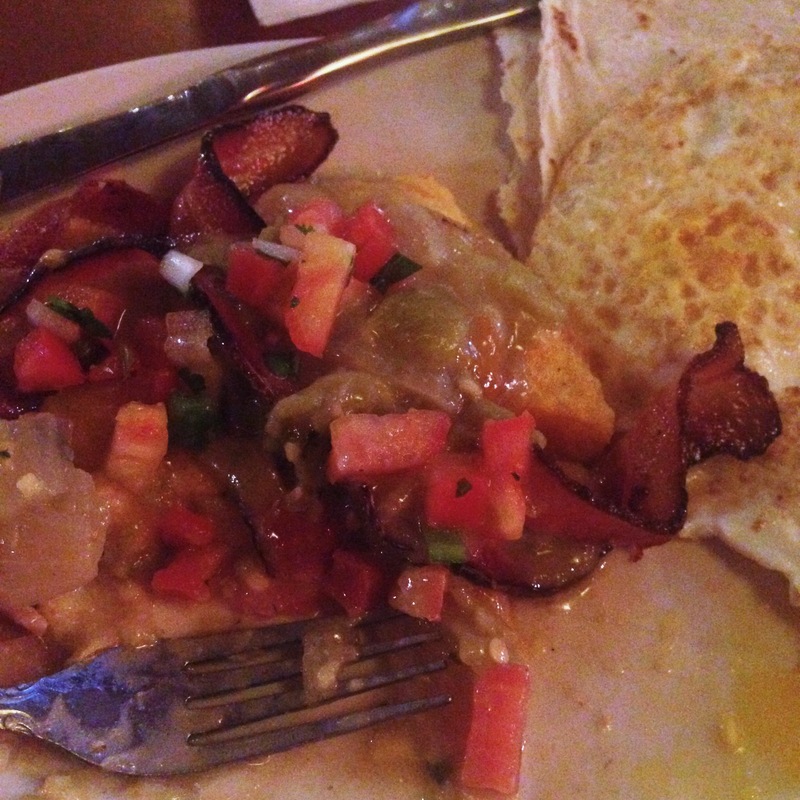 Most of their menu is South West or Tex-Mex inspired, so in addition to the eggs, I also get a tortilla. Two of my favorite things. Only sad part is that it doesn’t photo well. My other favorite menu item is the burger. I like mine with brie and apples, but my date for the evening went with bacon and cheddar. I generally think they make a good burger. Tons of topping choices. 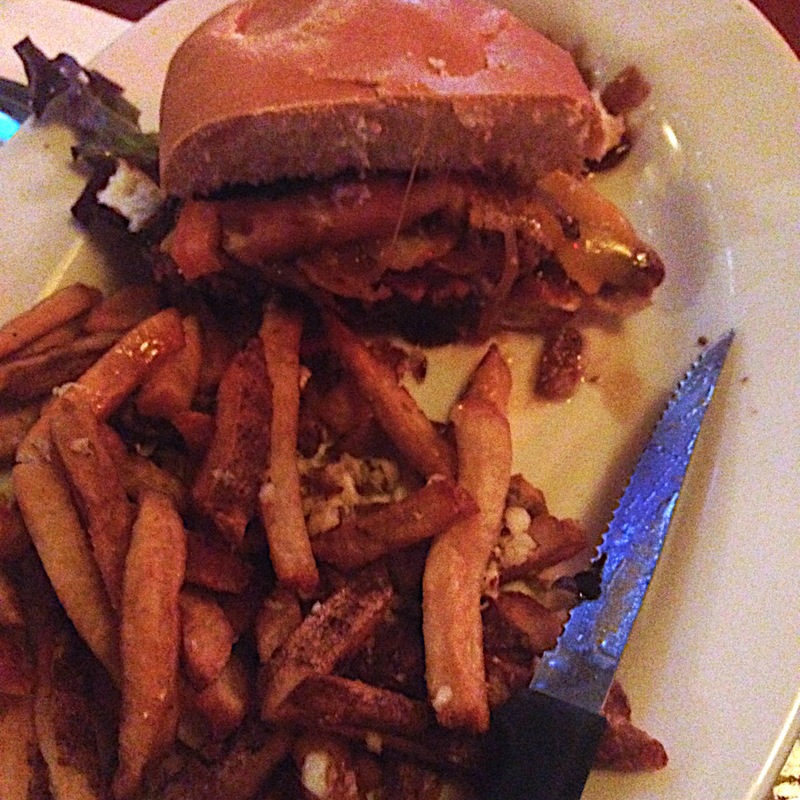 This one, however, was definitely super overcooked, but the fries were good. This entry was posted in All Good., Charm City, Dinner, Drinks, Hampden. Bookmark the permalink.